Callie, Nicole and I decided to take a day trip to Reims, which is in the Champagne region of France. It is only about a two-hour drive from where I live. The drive is gorgeous– fields of green and rolling hills. The French countryside is unmatched. I know that many people who visit usually do not get a chance to take a drive out into other areas of France other than Paris but it is truly extraordinary and a must-see. Reims usually brings tourists to its city because of its champagne– there is 120 kilometers of champagne cellars there! 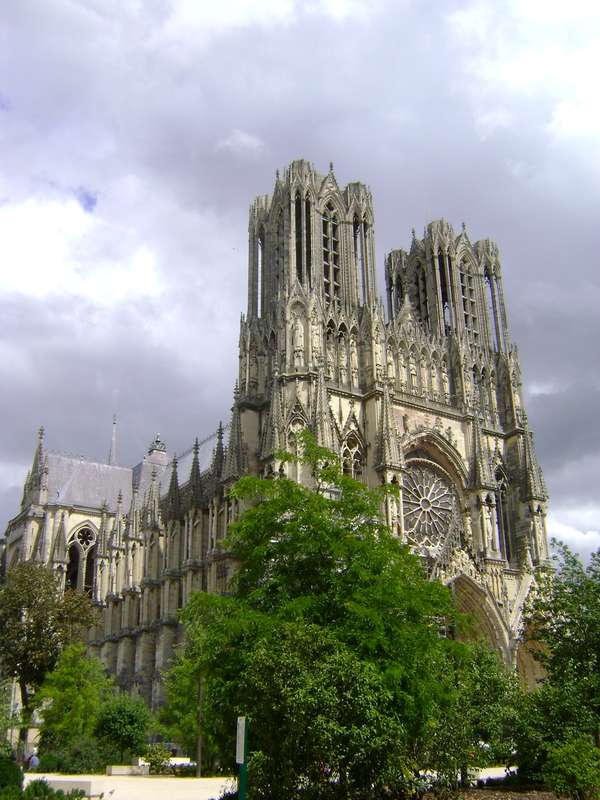 But there is so much more to the city, which is also known as “The Coronation City” because of the history of Notre Dame de Reims. When we first arrived in the adorable city of Reims, we went to the Notre Dame de Reims. It is this incredible cathedral that is the center of Reims. The architecture is incredible and the stained glass is breathtaking. Notre Dame de Reims is unique because this is where 33 kings of France since the 11th century were crowned. It was built in the 13th century and although has had a long history of surviving through events like the Hundred Years’ War and WWI, it still has incredible beauty. I can get lost in places like this. I just want to see every little bit and learn about it. I always imagine what it looked like in the past– with ornate kings and royalty lining the pues. Me getting ready to eat my first course of tomatoes and mozzarella. So yummy! After exploring the cathedral, we decided to venture into the city and find something to eat. We decided on this delicious café and got to sit outside enjoying the incredible weather. In France, most restaurants and cafes offer a normal menu as well as an option that for a certain price you get three courses you choose from a selected menu. I decided to choose that option– fabulous decision! For my entrée, (which is the appetizer in France), I got tomatoes and mozzarella in balsamic vinegar. My second course was basil crusted salmon with white butter risotto. This was amazing. The flavors were so vibrant and mouth-watering! I didn’t want it to end. Finally, I finished up with dessert. I got fruit in lychee syrup that is extremely popular in France. Lychee kind of tastes like grapes but has a little sweeter taste. It is incredible how even just fruit tastes so much more delicious in France! From lunch, we walked over to visit the Horticultural Gardens. This was probably one of my favorite parts of the day. These gardens were created in the 19th century and have frequent floral shows with different themes. When we visited, the theme was “Fairy Tales and Legends of Champagne.” They were spot on with the theme because as soon as I walked into the gardens, I seriously felt like I was walking into a fairy tale. It was so incredibly green and luscious. It was so fun to explore the gardens. Callie, Nicole and I enjoyed ourselves playing and taking pictures. I cannot even put into words how incredible the gardens were. Me, Callie and Nicole at Taittinger trying the delicious champagne! Next we headed to Taittinger to have a tour of the champagne caves. When I first thought about moving to France I had researched places here I really wanted to go and the champagne region was high on my list. I am so excited I got to visit a champagne house and Taittinger was definitely incredible. They take you down to the champagne caves and the tour is definitely worth 10 euros. The tour guide did a great job explaining everything and the best part was you get a sample at the end of the tour! Now I completely understand why they are famous for their champagne here! About 20km outside of Reims is a town called Verzenay that we were all very interested in seeing so after touring the champagne house, we headed that way. Such a charming little town with incredibly gorgeous views! We went up to La Phare where we could see the whole town and all the vineyards. We spent our time walking around and just taking in everything. I cannot believe that I only live a couple of hours from here! The weather was phenomenal, too, which added to the wonderful day. After soaking in the sun and the views we headed to the other side of the town to the Mumms champagne house. It was really neat to see the view from the other side–equally as beautiful! Check out my pics from here!